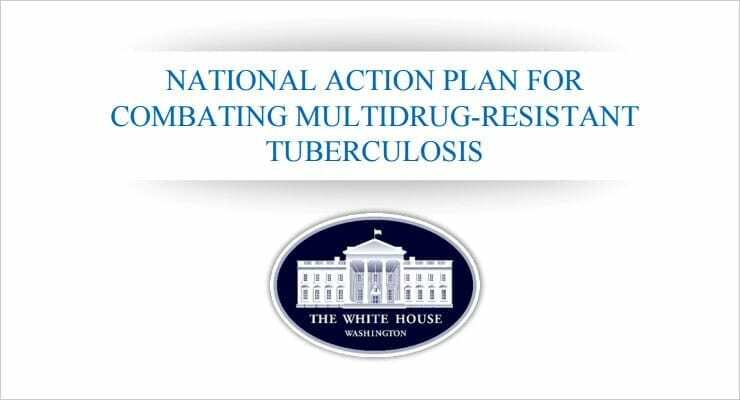 The White House today released a comprehensive National Action Plan for Combating Multidrug-Resistant Tuberculosis, identifying critical actions to be taken by Federal departments and agencies to combat the global rise of multidrug-resistant tuberculosis (MDR-TB). The National Action Plan is an effort to articulate a comprehensive strategy, and to mobilize political will and additional financial and in-kind commitments from bilateral and multilateral donor partners, private-sector partners, and governments of all affected countries. TB has caused more deaths than any other single infectious disease worldwide, killing more than 1.5 million people each year; more than 4,000 people die of TB every day. Fewer than 20 percent of individuals with MDR-TB receive the drugs they need to combat the disease and of them, less than half are cured. Those who do not receive treatment or are not successfully treated continue to transmit the disease to others and face prolonged illness and likely death. In the United States, the number of individuals who develop TB has declined annually over the past 20 years, falling below 10,000 for the first time in 2012. This dramatic progress could, however, easily be eroded or reversed by the further development and spread of MDR-TB and extensively drug-resistant TB (XDR-TB). The National Action Plan identifies critical immediate actions the U.S. Government will take over a 3- to 5-year period, with appropriate appropriations, to contribute to the global fight against MDR-TB. It is aimed to make an impact on the global MDR-TB epidemic in that timeframe, emphasizing patient outcomes and program results through innovative approaches. Goal 1 – Strengthen Domestic Capacity: Help prevent TB drug resistance by ensuring that all patients with TB disease in the U.S. are promptly detected and treated, and that people who have been in close contact with infectious TB patients are identified, monitored, and if necessary, treated. An outbreak sparked by an individual with undiagnosed MDR-TB or XDR-TB could have serious consequences due to the difficulty and costs associated with treating patients infected with these resistant strains. Goal 2 – Improve International Capacity and Collaboration: Broaden access to diagnosis and treatment by engaging providers from both the public and private sectors in the most affected communities, improving innovative health technologies and patient-centered approaches to care, and advancing diagnostic and treatment options. Goal 3 – Accelerate Basic and Applied Research and Development: Help with the development of rapid tests to diagnose TB and determine susceptibility to available drugs; novel therapies and drug regimens that could cure TB and MDR-TB within weeks, making it easier for patients to complete therapy and decreasing opportunities for the emergence of drug resistance; and new vaccines with the potential to prevent all forms of TB. The White House emphasized that implementation of the National Action Plan and achievement of its goals and objectives will depend on sustained coordination among U.S. agencies and global health partners; U.S. and global front-line health-care providers and public health laboratories who detect, diagnose, and treat MDR-TB; private sector partners who advance the development of innovative tools for the detection, treatment, and prevention of MDR-TB; and community leaders, patient engagement organizations, and other community-based groups that provide health literacy and social support to patients undergoing treatment.